52 Ancestors, No. 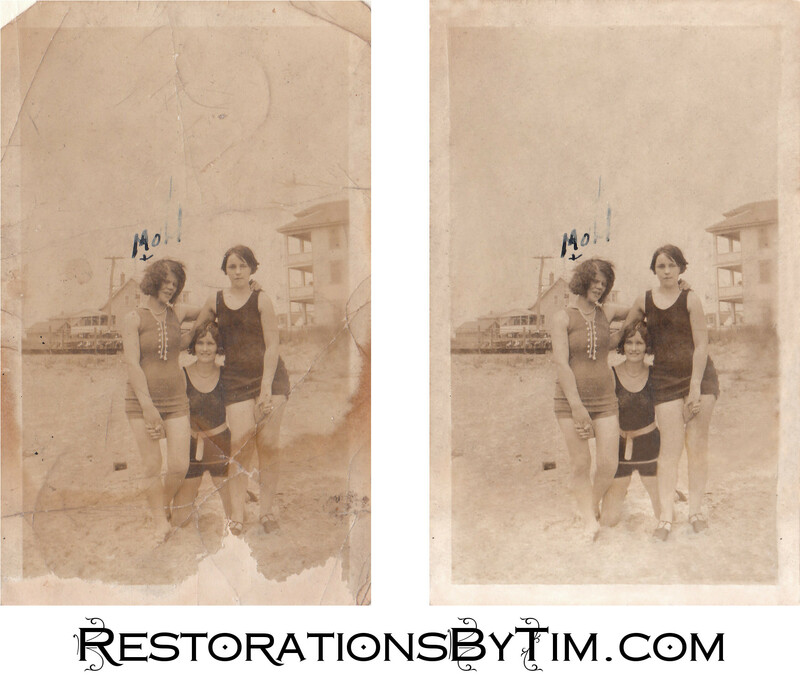 6: “Great-Grandmom” Johanna Harrison | Photo Restorations by Tim G.
I’m paying homage this week to the other grandparent that I lost during my youth. A great grandparent. “Great-Grandmom” Johanna Harrison. She died on June 14, 1987, about two months before my seventh birthday. I think she didn’t like having her picture taken, because I remember a few pictures of her shielding herself from the prying eyes of sneaky cameramen. She relied on colorful, handmade afghans for comfort. I believe some of these are still around the eave closets of my grandfather’s home. She fell ill when I was five or six, and went in for an extended stay at either a hospital or a nursing home. I believe I remember making a weekly family trip to visit her bedside, every Sunday after church. Then she was gone. Johanna Christina Smith was born in Philadelphia on August 25, 1908, a birthday she would later share with her daughter and one of her grandsons. Her parents were both Irish immigrants. Her mother, Elizabeth Smith (nee Harkins), was from County Mayo. Her father, William Smith, from County Galway. The two married in Philadelphia, in September of 1901. Johanna would be the fifth of six children. Her father, a railroad brakeman, was killed on the job on April 4, 1912, when Johanna was not yet four years old. Johanna would always be apprehensive about her own son, William, working for the railroad. As of 1920, census records show Elizabeth living not only with her six children, but also seven boarders, whom I assume supplemented the family’s income, possibly along with the Ladies Auxiliary of the Brotherhood of Railroad Trainmen. On February 5, 1930, Johanna would marry my great-grandfather, William Pickersgill Harrison, III. 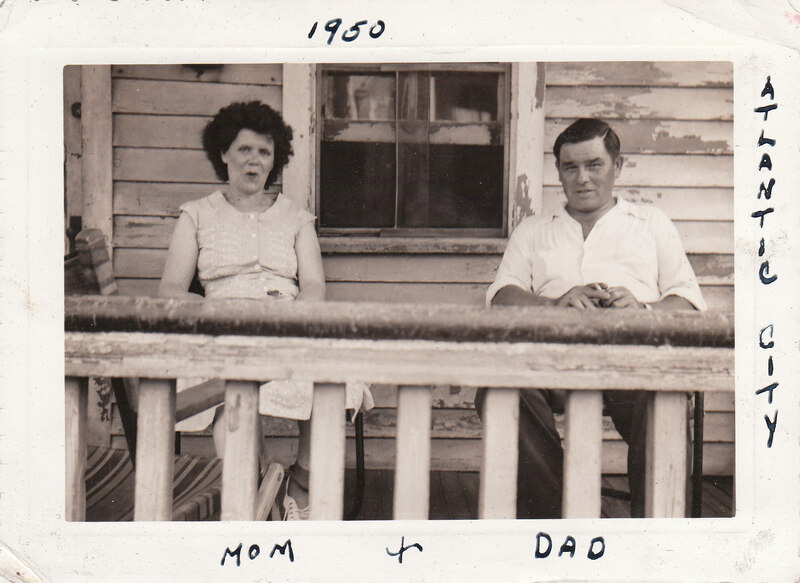 The Harrisons would have two children: Joan, my paternal grandmother, and William Joseph, my great uncle. Great-Grandmom with my brother at my first birthday party, warning of danger. My father had three grandparents when he was born. Before his first birthday, he would have only one: Johanna Harrison. Johanna’s husband, William, would die of lung cancer in June of 1959. Johanna would stay with us for another 28 years. She doted on her grandchildren. My father remembers going for walks in the woods with her near his childhood home in Northeast Philadelphia. Later on, she took a liking to my mother, who remembers a welcoming smile, long evening chats, and poignant words of wisdom. Johanna would be the only one of my great-grandparents who would live long enough to meet me. My mother remembers her playing “boo catcher” with us youngsters, which was evidently an older variation on “peek-a-boo”. 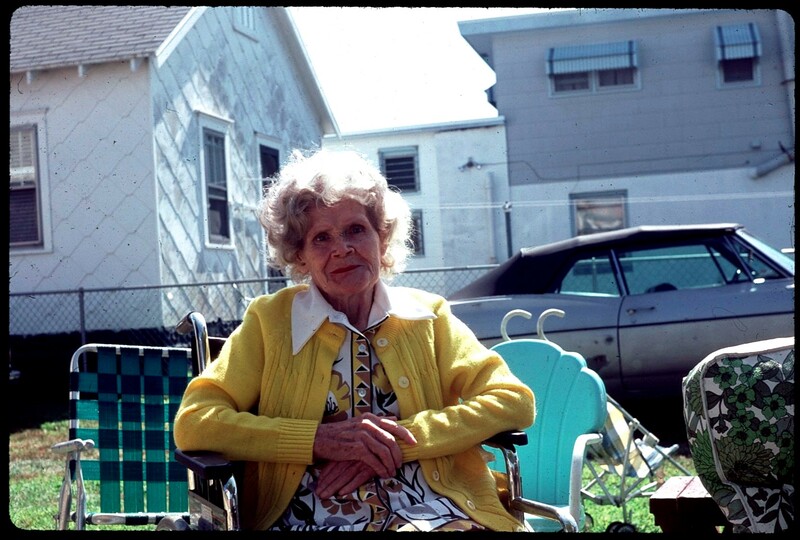 The photo of Johanna that I chose to restore is one that I first scanned not long after my grandmother died in 2008. My grandmother labelled her mother, “Mom”, but did not identify the other women for me. They are on the beach, presumably in Atlantic City, in a symmetrical and carefully constructed pose. 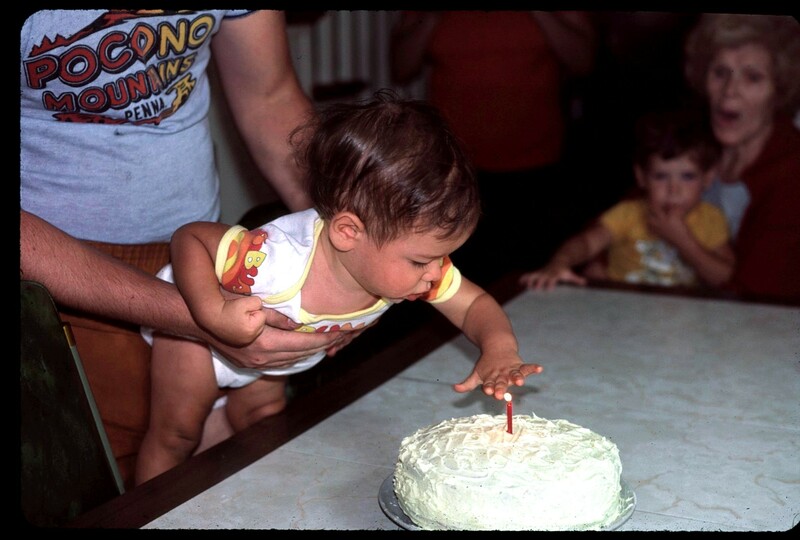 When I first scanned it, it was the most damaged photo I had seen up until that point. I had aspired one day to restore it, but at the time I really had no idea how. After five years of practice, I’m pleased to report that this once-daunting restoration is now a standard hour and a half job. Win! When Johanna Harrison died in 1987, she was reunited with her husband at St. Dominic’s Church Cemetery on Frankford Avenue in Northeast Philadelphia. I was too young to have attended her funeral, and I did not see her grave site until 2009, not long after I had begun researching the family’s history. Now I remember her whenever I pass the cemetery on my way into town. 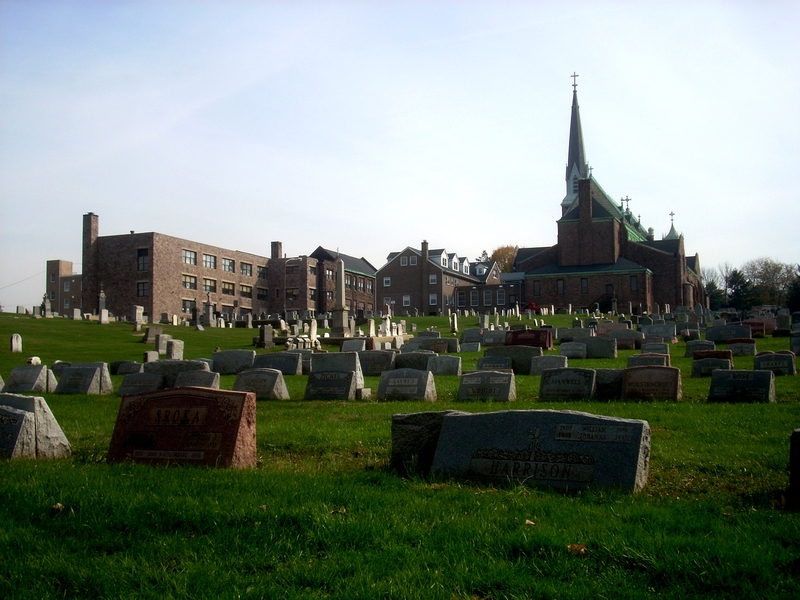 The final resting place of William and Johanna Harrison, behind St. Dominic’s Church, in Northeast Philadelphia. 52 Ancestors No. 9: William Pickersgill “Pud” Harrison, III, an Amiable Longshoreman | Photo Restorations by Tim G.